How Can I Make My Cars Air Conditioner Colder? 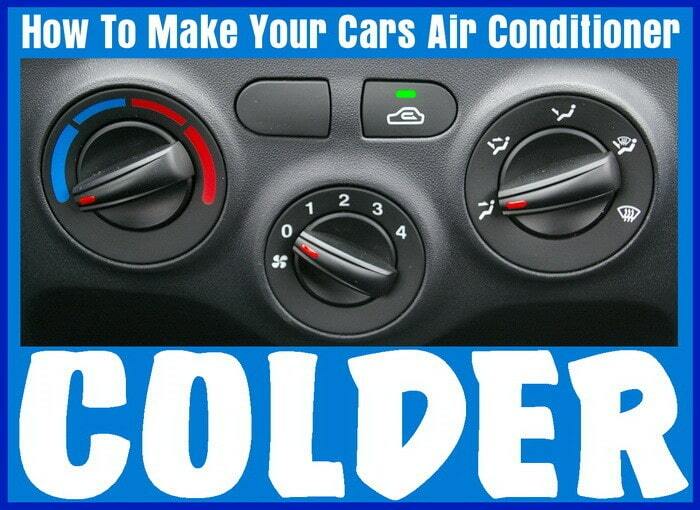 1 – Yes there are things you can do to make your car ac colder and blow out faster. One super simple tip is to turn the ac vents going to the passenger side off. 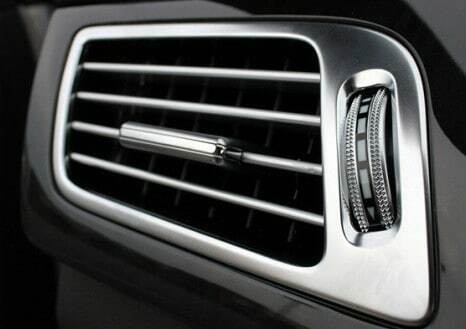 Usually there is a control wheel on each air vent that allows you to position and point the air flow. This control wheel or slider will also allow you to shut the vent. If you shut the AC vents that go to the passenger side, you will get MORE AIRFLOW to the ac vents that are on the drivers side. This will increase and double the airflow to the drivers side. 2 – Park your car under some shade or use a window sun blocker. On a hot and sunny day the temperature inside a parked car can get to 145ºF. This is even if the outside temperature is only 90º to 100ºF. By blocking the sun entering the windows of your car, you will keep it cooler therefore making the ac not have to work as hard once you get in and begin your drive. 3 – Never put the pedal to the metal. When you stomp on the accelerator, you are taking away the power needed for the ac to run efficiently. Some cars use the extra acceleration you are demanding by using all power necessary therefore your ac will keep blowing air but will not be as cold. In hot weather when running your cars ac, do not accelerate too quickly, accelerate gradually and this will keep the ac running as normal. 4 – Be sure to point the ac vents directly at you. One to your head and one to your mid body. This will keep you cooler instead of leaving the ac vents just blowing straight, so position them to face you. 5 – When your car has been sitting in the sun, the car will obviously be hot inside. To minimize the heat in the car and get your ac to blow cold air as fast as possible… start your cars engine, turn the blower fan to the maximum speed and then turn on the A/C by pressing the ac button. Open all the windows in your car and select OUTSIDE air mode to allow the blowing air to push the hot air out of your car and the ac system itself. After driving a minute or two and the car is aired out, close all the windows. Set the air flow to the upper and lower vents. Turn the knob to RECIRCULATE mode for maximum ac. Auto stores now sell a refrigerant that you can purchase and recharge your car ac system yourself. It is called A/C R-134a Air Conditioning Refrigerant. These bottles of refrigerant come with a gauge so you know when your ac is fully charged. 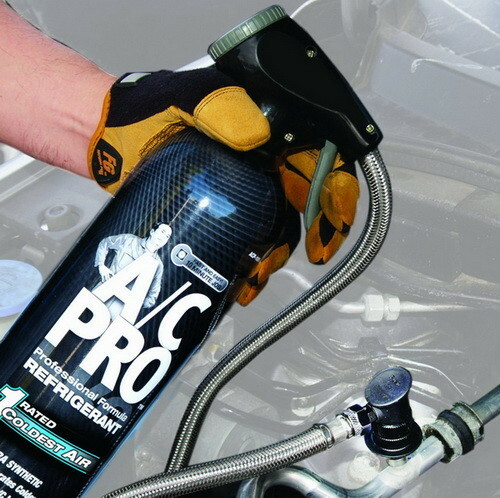 If you decide to purchase this and DIY, see the picture below to know where to add the AC refrigerant in your car. IMPORTANT INFORMATION WHEN USING AC REFRIGERANT: Your vehicle’s air conditioning system has two sides, a LOW pressure side and a HIGH pressure side. This depends on where you are standing in relation to the ac compressor. 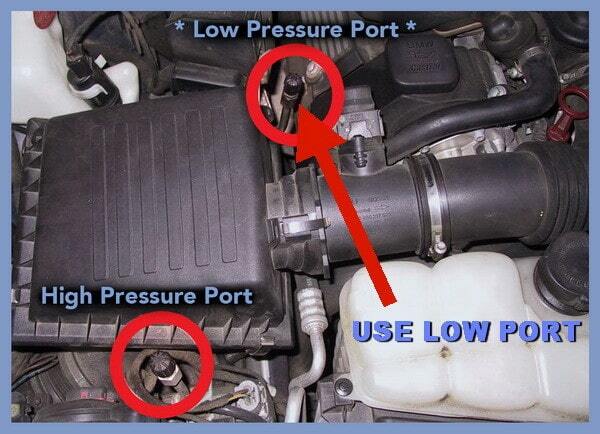 You add the refrigerant to your A/C through the LOW pressure port. Your car will have a cap over each pressure port. One cap is labeled “H” for high pressure and the other is labeled “L” for low pressure. The pressure ports are different sizes so you are unable to attach the hose to the wrong port. Where do i add refrigerant to my cars ac? 1 – Be sure your heater damper door is sealed properly and does not allow heater air to be mixed with ac air. 2 – If your car ac is cold but there is not enough airflow, make sure nothing got sucked up into the return air under the dashboard. This will restrict airflow and cause your ac to not perform as designed. 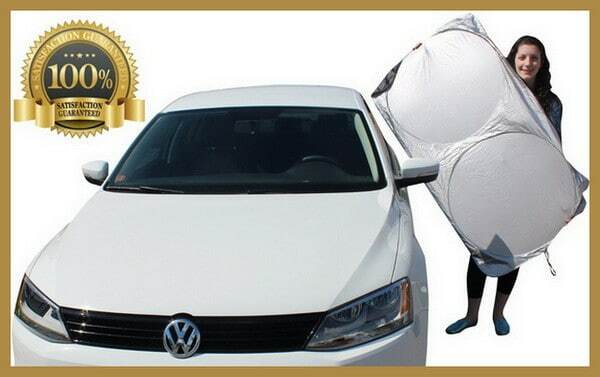 A plastic shopping bag or similar can get sucked in there and restrict the air therefore causing less volume of air being blown into the cars cabin. 4 – Your car may be low on R-134 refrigerant or Freon. This will cause the ac air to not be cold but the air will still blow out of the vents. If this is the case you can either DIY and buy a bottle of refrigerant yourself or take it to an ac auto repair shop. 1 – Newer cars use a new refrigerant called R-134a. It has replaced R-12 which was called “Freon.” The R-134a is now used as it protects the environment by not using CFCs that can damage the ozone layer. 2 – Your cars AC unit creates cold air by using the liquid refrigerant and then turning it into a gas. This gas then makes the ac in your car cold. If your car ac system is not working properly and you have used all the methods and tips above, you may need to take your car to an auto ac repair shop. Some A/C repair centers will check your ac system for free and only charge you if work needs done. See the videos below for more information. How to Recharge Your Car AC with AC Pro! Simple fixes that might get the car’s AC system working better! Do you know of other tips to make a cars ac system blow colder air? Please leave a comment below. In South Texas or Florida, hot climates, always under charge by about 10%. The lower psi means you will get a lower vent temp. One thing I did that seemed to help was insulate the tubing that is exposed to the hot air of the engine. I Used a heat resistant pipe insulation and covered all tubing. I loved how this mentioned that this mentioned trying repositioning your car’s AC vents. That’s like checking to see if the computer is plugged in before going into a panic. For the most part, I just like learning things I can do or check before taking my car in to get repairs. We are getting some hot days here at the end of summer, and my air conditioner isn’t working too well. I have had the hose break before, and I was wondering if that is something that I would be able to fix on my own if it turns out to be the problem again? I rather fix it myself if possible instead of spending time and money to take it to the mechanic. We are talking about temps not air flow. Actually it is both and both are described above. We are giving ALL options that may help a cars AC get colder. Max air flow will cool the car the quickest. If you can’t improve your car’s air conditioning system, then you certainly don’t want to reduce it’s efficiency further by blocking off vents. Best tips for good AC: Keep your refrigerant levels topped off, but within the limits. 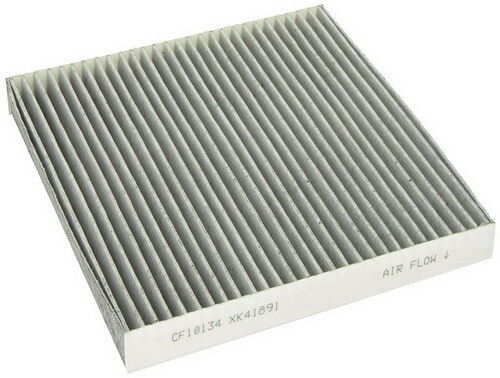 Clean or replace your in-cabin filter. Have the cabin air re-circulate, rather than bringing in fresh air. Run your fan on high. We suggested closing the passenger side air vents when the driver is alone to bring more cold air to the driver. This is assuming the AC is working and to bring a larger amount (volume) of COLD air flow to the driver. Even when the AC is not fully working to it’s highest cooling potential (once car is initially started), the more air flow over the driver, the better the airflow will wick away sweat and moisture and begin to cool off the driver. The AC in my car has been kind of warm instead of cold lately, so I’ve been thinking of taking it in for repair. Now I will check out all of these things first because it sounds like it may be an easy fix. Previous post: Power Out In One Room But The Rest Of The House Has Electricity?